Why is it that something with a wrapper is preferable to a a whole food such as Apples? One of the reasons processed food sells so well is that an apple doesn't have a gold wrapper around it. With children, the call of the wrapper is practically unstoppable. As well as the desire for food in shapes (think chicken nugget). Their is part of an aisle in the supermarket devoted to Fruit Snacks that are not made of fruit - and my kids ask for them every time we pass them. So, what to do? 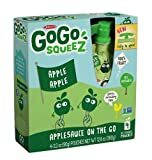 GoGo squeez has packaged apple sauce that is remarkably free of additives and tastes pretty good. It is only 60 calories a serving and is as close to an apple with a gold wrapper on it as you are going to get. The box advertises "no sugar added" - but apple juice concentrate is pretty high in sugar. Whenever I see a fruit concentrate on the side of the package, I decide that it means added sugar. BUT, even with this subterfuge, GoGo squeez is a pretty great choice. It tastes like apple sauce and feels like a smoothie. You just slurp it up through it's little tube. They cost $3 for 4 in a package and can be found in the "Natural Foods" section of the grocery store. My strategy with these is to treat them like treats. My children, because of the packaging, absolutely think this is candy. Fantastic! Parents can give this instead of a candy bar or other junk food snack and feel pretty good about it being pretty healthy. Of course, the packaging is going to end up in a land fill - so then you get to feel guilty about that. How do you deal with packaged snack love? Please share. A Rare Find: A Packaged Food that is Healthy and Delicious!